Few things are more important to our life than words, both written and spoken. They are the primary means of communication. They mark one of the major differences between people and animals. Without them, we would be confined to the isolated prison of cattle and apes. One of the main tools I have in order to write this reflection are words. They are letters formed together. They have sounds and they mean something to me; especially in the area of counseling, which I do extensively in my ministry. Words, how they are said, and words not said at all, communicate deep meaning. We have read the Bible. It is a book filled with marvelous scribbles that build letters into words, and words into sentences, and sentences into meaning. Words have the power to reveal. Of course the opposite of that is also true. Words can be used to conceal. All of us have been deceived by lies and disappointed by false promises. But eventually, we learn the truth. Any deceptive use of language is destined to discovery. My mother always told me that the first lie needs several others to follow in order to keep the lie going. There is an old German adage which says, "Lies have short legs." They cannot run very far. Given enough time, words are an amazingly accurate test of what we are on the inside. Jesus said, "A good person produces goodness from the good in their heart. An evil person produces evil out of his store of evil. Each one speaks from his heart's abundance." For an example, Benito Mussolini said, "War alone brings human energy to its highest level, and puts the stamp of nobility on those who have the courage to face it." Now here is a different one, a very different one. "Lord, make me an instrument of thy peace. Where there is hatred let me sow love." Saint Francis said that. Each man spoke from the abundance that was in his own heart. Words do have the power to reveal. 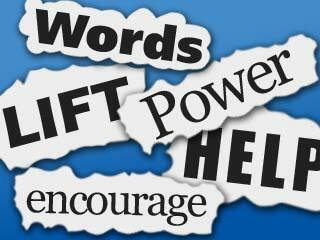 Words also have the power to help, to heal, to encourage, to lift. Of course, the opposite again holds true. Words, wrongfully used, can cut like a knife and bruise like a fist. The difference is that cuts usually heal, and bruises soon fade. But the wounds that words inflict may remain for years. I would guess with certainty that any reader of this article can recall some verbal injury, from childhood. However, I want to focus on the positive side of words. Few things on earth have the power to inspire a faltering spirit. When we read the words from the pen of Saint Paul we read a doctrinal statement. However, it was written as words of encouragement. Saint Paul wrote these words of hope for his people at the time and they can be applied to us today; "Be steadfast and persevering, my beloved friends. You can know that your toil is not in vain, when it is done for the Lord." Here is another example of words of encouragement, so simple that even a child can say it, "Thank you." These words are not difficult to say. All of us, every day, are recipients of numerous courtesies. People who do so many things for our benefit, that we sometimes take them for granted. "Familiarity breeds contempt," and one of the places where we fail to use words of appreciation is in our own home. Words of appreciation in our own home are probably the most important words we can hear with the exception of "I love you." In the church, we sometimes downplay the importance of words. We emphasize that words can never take the place of deeds. And that is certainly true. Jesus made the same emphasis. Yet he never neglected the appropriate use of words. He was continually helping someone by the things that he said. "Do not be afraid," he often said that. "You are valuable," he said that to all kinds of ordinary people. Our Lord, the tireless doer of good deeds, was a masterful user of words. He knew their power. An old Chinese proverb says, "One picture is worth a thousand words." To which someone replied, "Yes, but it took words to say that." God has given us the power of speech. May we use it wisely and use it well to honor him and to help one another.